Question: Did the cast and crew do anything special on the last day of shooting? Rupert Grint: Yeah, they played a video. We did this thing called the Golden Board. Have to have Dan [Radcliffe] explain that, but it’s basically a big count-down. This film was like 260 days or something. Every day we had this board, like ‘day one,’ ‘day two’ and each time it would be a silly saying and stuff. They kind of edited all that together and it was just really nice to see that. It was actually quite emotional too. Q: We heard your birthday happened during shooting? Tell us about that. Grint: It was cool. It was my Golden Board. They set up a piñata in the Weasley house and I was trying to hit it and, yeah, that was quite good. Q: Within this family of Harry Potter, you also have the Weasleys. Do you guys feel a certain bond in terms of this being your on-screen family that will always be close? Grint: Yeah. Definitely. We have Julie Walters, ‘cause I’ve worked with her before outside of “Potter,” and she, naturally, is quite a motherly type and she’s seen us grow up as well. And she really kind of cares about us. The twins as well. I’m really good friends with them. I see them quite regularly, yeah, so we’ll always kind of see each other. Q: Is there any particular scene in all the films that you wish you could have been in, even as a different character? Grint: I think, in the sixth film, I really liked the scene with Harry and Dumbledore in the boat. That was really cool. Q: Do you have ideas about maybe directing some day or what you might like to do 10 years from now? Grint: Directing’s a nice idea, but in 10 years I’m not sure. I definitely want to keep on acting, and just do different roles. I’m looking forward to that. Q: You’ve had quite a variety of roles in 10 years, between “Harry Potter” and some of the other films you’ve done. Grint: I’m quite keen. I’m always going to miss “Harry Potter,” but it’s the right time to move on and I’m ready to do different things. Q: Have you any other projects lined up in the near future? Grint: Yeah, there are a few things; nothing definite yet. But it has been nice just to have a break now. This last film was really exhausting and I haven’t been on holiday for like three years and it was nice to kind of finally do that. Q: They’re going to be turning the studio into a museum. Have you thought about that? Grint: I know, yeah. They said they were going to make replicas of our dressing rooms as well so people can see them. It’s just quite a weird thought, but yeah, that’s great. I mean, it’s such a special place to us because I’ve spent more time there than my own home, really, and to know that it’s going to live on is really great. Q: You’ve bought some outrageous things in the past. You mentioned a mini-ice rink? What’s some of the items you may have purchased that are not sort of everyday items? Grint: I supposed I’ve got some weird things. The latest thing is we’ve got miniature donkeys. They’re just like normal donkeys, but kind of half the size. Q: How many and what are their names? Q: For breeding purposes or just as pets? Grint: Just as pets, yeah. I’ve got miniature pigs as well, and miniature hedgehogs. Q: How many different animals do you have? I mean, your entire family? Grint: We’ve obviously got dogs and cats and a parrot and peacocks. Q: You’ve got a zoo! What size of place do you have to have all these things? Grint: I live in the country, really. Just outside London. There’s a few acres, yeah. They’ve got some good space. 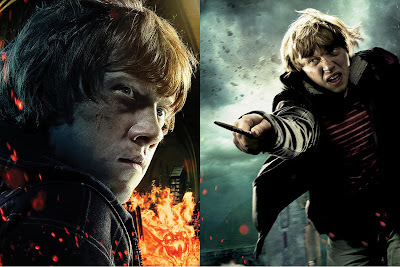 Distributed by Warner Bros., “Harry Potter and the Deathly Hallows – Part 2” will be released in Philippine theatres and IMAX, in 3D and 2D, beginning July 14, 2011.